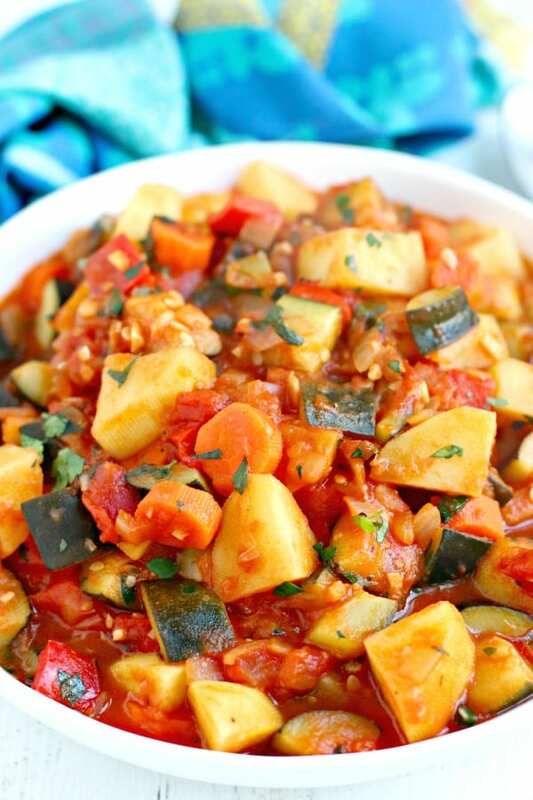 Zucchini Stew with Potatoes is a rustic Italian-inspired main dish. This vegan and gluten-free recipe is healthy and loaded with vegetables. Enjoy a warm bowl of this comforting stew on its own or with some crusty bread. Zucchini is a summer staple in my house. I love using it to make Pasta with Zucchini (Courgettes), Roasted Ratatouille, and Vegan Pasta Bake with Zucchini. And sometimes I like to grill it and dip it in Cashew Ranch Dressing as a snack. It’s easy to find at major supermarkets and at farmers markets, plus this summer squash is easy to grow in your garden. Besides being delicious, zucchini is very healthy. It can improve digestion, slow down the aging process, and aid in weight loss. I recommend reading the article 9 Impressive Health Reasons to Eat More Zucchini by the Food Revolution Network to learn more. 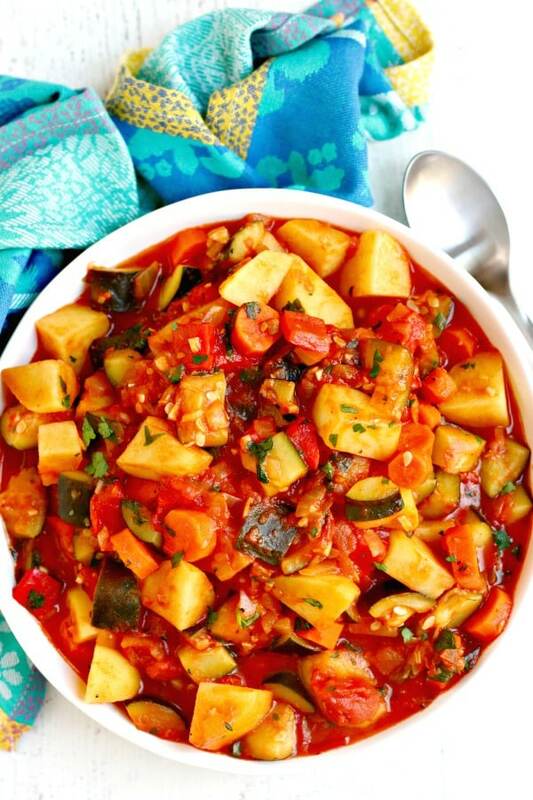 In addition, once you try this Zucchini Stew with Potatoes, you’ll want to eat more zucchini all the time! These ingredients are all easy to find and budget-friendly. And they are all part of a plant-based Mediterranean diet, which is one of the healthiest ways to eat. You can use whatever type of potatoes you prefer, such as Russet or red. I like to use my favorite gold potatoes. 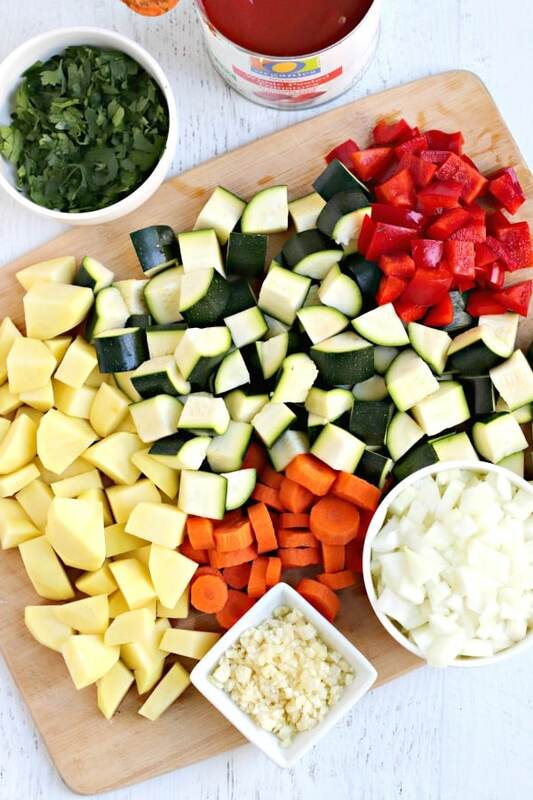 As you can see in the above photo, there’s no need to dice the vegetables small for this chunky Italian zucchini stew. The only special equipment you need to make this zucchini stew is a large pot or dutch oven. I’m a big fan of Le Creuset, but Cuisinart is another great choice at a more affordable price. The first step in making this recipe is to saute the onion in a little olive oil. Then add the garlic and saute for about 30 seconds. Next the zucchini, potatoes, carrots, and red bell pepper join the party. After about 5 minutes, add the canned whole tomatoes with their juice. Smash the tomatoes down into the vegetables with a wooden spoon and break them apart a little. Once the mixture comes to a low boil, reduce the heat and simmer, stirring occasionally, until the potatoes are tender and the vegetable stew has thickened. Finally, add a little salt and pepper and some fresh parsley and it’s time to eat! I’m perfectly happy eating a big bowl of this rustic vegetable stew on its own. But if you have some crusty bread, heat some up for dipping in the stew. And if you want to boost this meal with some extra protein, I recommend adding in a can of chickpeas, cannellini, or kidney beans. Moreover, if you have other vegetables on hand like eggplant, celery, or green beans, they would be wonderful additions to this zucchini stew. 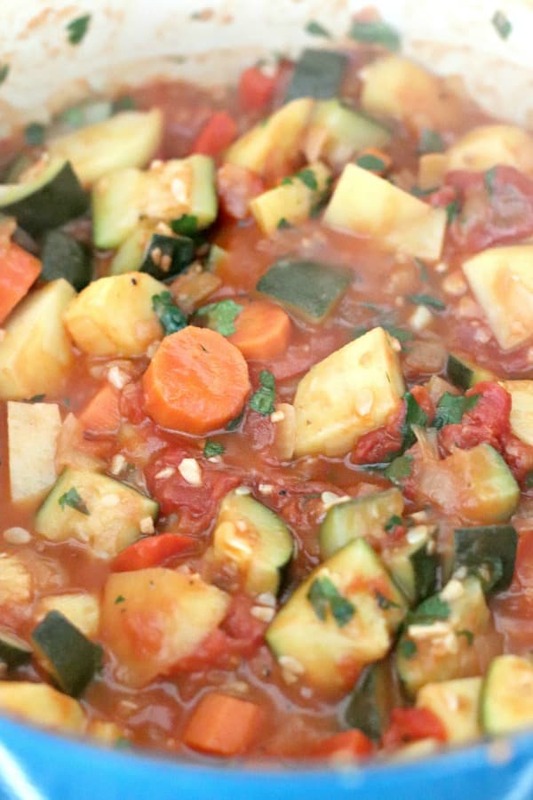 This chunky vegetable stew is a great make-ahead meal. You can prepare it on the weekend and enjoy it reheated during the week. It will last for several days refrigerated, and you can even freeze it. I like to freeze it in individual servings in glass containers or mason jars. Just be sure to leave a little room at the top since the zucchini stew will expand when frozen. 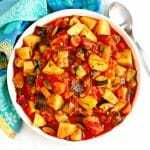 Zucchini Stew with Potatoes is easy to make in about an hour. This rustic dish will remind you of a recipe your Italian grandmother would make, if you had an Italian grandmother. It’s especially perfect during the summer when zucchini is abundant and you have more than you know what to do with. And for another delicious recipe, I recommend trying Zucchini Chickpea Stew with Quinoa. 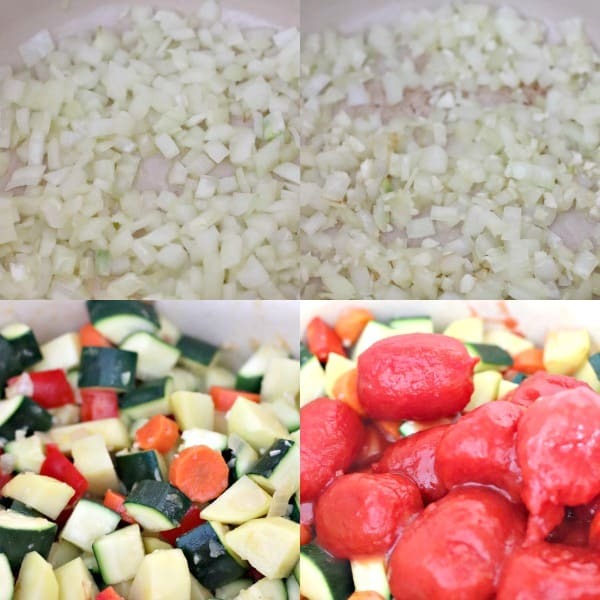 In addition, if you purchased a 3 pound bag of potatoes, you can use one pound to make Zucchini Stew with Potatoes and the other two pounds to make Greek Lemon Roasted Potatoes with Chickpeas. Saute the onion in the oil for a few minutes until soft and slightly translucent. Add the garlic and saute about 30 more seconds until fragrant. 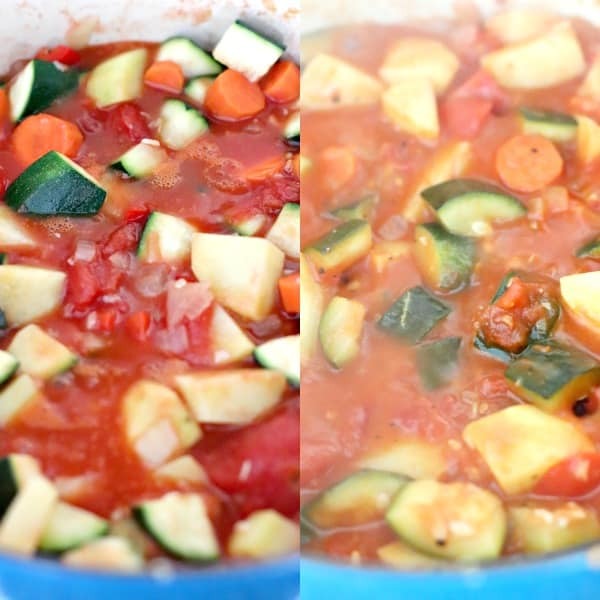 Then add the zucchini, potatoes, carrots and red bell pepper to the pot and saute for 5 minutes. Next add the tomatoes with their juice to the vegetable mixture. Press down the tomatoes and break them apart with a wooden spoon. Bring the stew to a low boil, then lower the heat and simmer,uncovered, stirring occasionally, until the potatoes are tender and the stew has thickened. Season to taste with salt and pepper and remove the stew from the heat. Leftovers can be refrigerated for several days and reheated on the stove or in a microwave. This is so yummy. We call it cocozelle and patata, and my dad calls it Hakuna Matata. I was tired after a long day and didn’t get home until 7:30 pm. Didn’t feel like cooking but didn’t want to eat something bad for me so I made this. It is a winner! Thank you! Thanks Cheryl! I’m so happy you enjoyed it!